The Capital Reach testing feature provides online test taking, immediate feedback for incorrect (or all) responses, automatic grading, and the ability to generate a continuing-education certificate for passing scores. Test reporting provides aggregate and specific user details from a password-protected website. Customers can also purchase this feature as a stand-alone testing application without a webcast. Customer-branded viewer surveys collect feedback from viewers and report both aggregate and detailed results on a password-protected website. 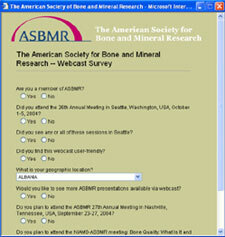 The "Ask a Question" features allow viewers to submit questions while watching a webcast. 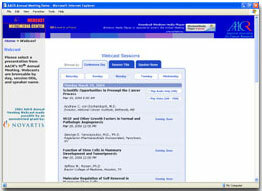 Questions are stored in the centralized database and can be forwarded to an email address. 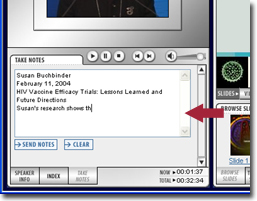 This is a popular feature in certain continuing education and training implementations where an expert resource is available to respond to viewers. A web-based tool is also available for customers who need to prioritize, filter, and respond to a high-traffic webcast session with a large number of questions. Capital Reach offers customized registration with up to 30 questions. This open registration system allows any viewer to register and view the session. We also offer password-based registration that limits viewership to a customer-determined list. Our password protection also supports subscription and pay-per-view modes. 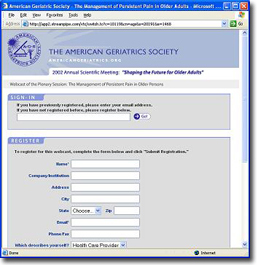 The collected registration information is made available from a password-protected website and is linked to viewing data. A confirmation e-mail is sent to registrants along with system requirements. Other forms of e-mail messages such as "Thank You for Attending" are also available. Customer-branded navigation page to organize access to a large number of sessions or speakers. 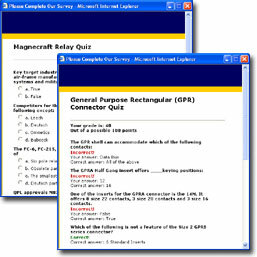 This page, or set of pages, can be customized to the unique needs of integrating into the customer's public web site or learning system.